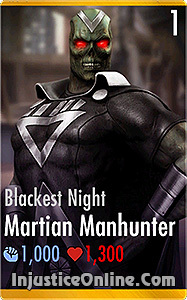 Bio: Blackest Night Martian Manhunter is an Injustice Mobile exclusive character, who arrived with version 2.6 of the game. As an original character he does not have any story in the comics or in the game itself. Martian Manhunter is Mars sole survivor and will risk anything to protect Earth and all of its inhabitants from destruction similar to the one that caused the extinction of his own people. Phase Assault: Martian Manhunter phases through the ground and reappears with a devastating uppercut. Soul Survivor: J’onn unleashes numerous shape shifting strikes. Son of Mars: Martian Manhunter teleports his victims to his home planet for a crushing blow. UNBLOCKABLE. Bag of Chocos: +10% Health for all Martian Manhunter characters. Mars, the Red Planet: +10% Damage for all Martian Manhunter characters. JLA Watchtower: +10% Energy Regeneration for all Martian Manhunter characters. 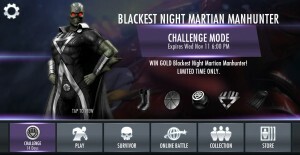 Blackest Night Martian Manhunter is an Injustice Mobile exclusive character with very high stats for health and power and very unique and useful abilities. While tagged in the character will cycle through three different states, with each giving him different advantages. LIFE DRAIN: While in this state Blackest Night Martian Manhunter will drain the life of his opponents adding it to his own and to the life of his team mates. 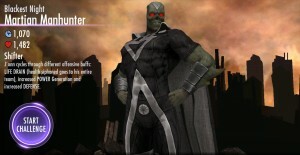 POWER Generation: In this state Blackest Night Martian Manhunter will generate power at a faster rate. 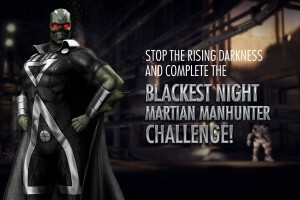 DEFENSE: In this state Blackest Night Martian Manhunter will take 50% less damage from all known sources. All these abilities make the character an excellent choice and fit for every team and give him and his team mates interesting advantage in Survivor Mode.